Welcome. I am so happy that you stopped by. My kitchen is always open for you to come in and sit and relax with a cup of tea while I share with you the inspirations for my art. We are having what we call a "cold wave" in Southern California and it is not expected to get over 50 today so we will not be in the garden looking for inspirations. Bentley, My Studio Assistant, is wearing his new Christmas sweater it is so cold today and is standing at the door waiting to come in. 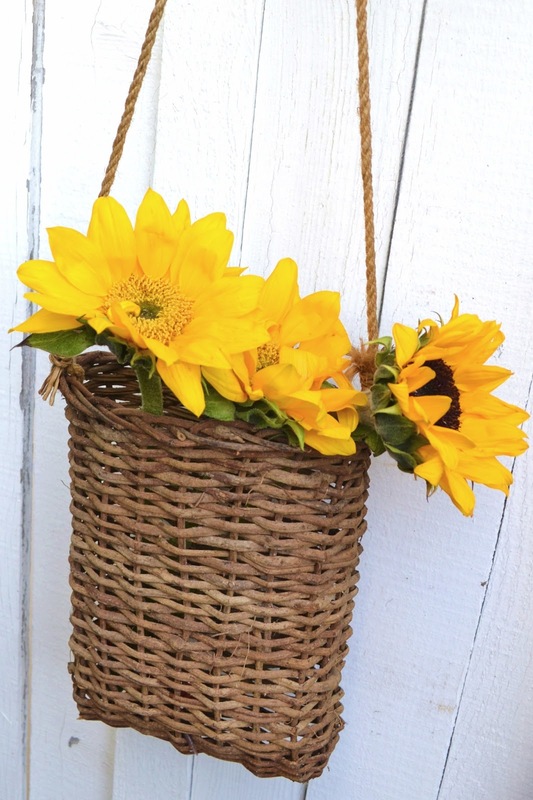 I just got home from Trader Joe's and bought a bunch of Sunflowers. I am using a new camera and have not figured out how to use it - sorry for the poor quality of the photos!! Can you tell that I love blue and white? 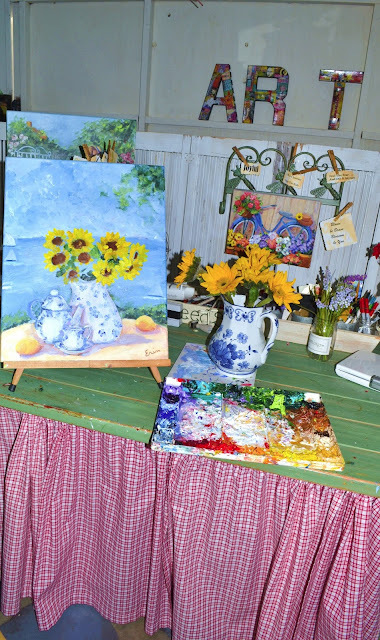 Now you know why so many of my paintings have a piece of blue and white china in them that I call my signature piece. I love having the mirror by the sink as it reflects the little patio garden off my kitchen. 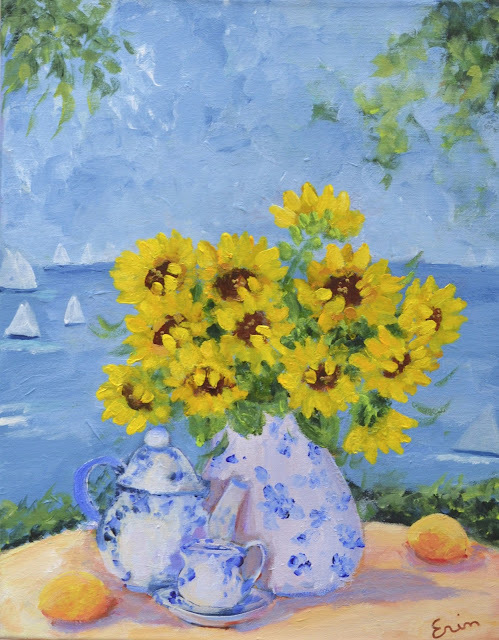 I ended up arranging the Sunflowers in a blue and white pitcher and decided to go into my studio to paint them. Let's go to the studio and I will show you the beginning painting. The beginning of the new painting. Here is the finished painting. Thank you for stopping by. I love hearing from you and sincerely appreciate your visit, comments, e-mails and those of you who follow my blog. My winter bulbs are starting to bloom and maybe by next week some of the Daffodils will be in bloom to paint. So beautiful; your painting is just lovely. Thank you for sharing! Bentley looks very handsome in his new sweater. 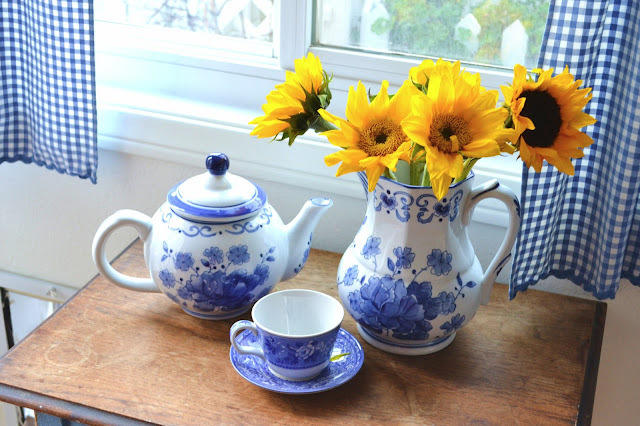 I am a fellow blue and white lover and enjoyed this peek into your charming kitchen. It makes me happy just seeing the cheerful colors and your painting is beautiful. It's been a long time since I've visiting the Painted Garden! I am working on a new way to keep up on all of my blogs. Yikes. First, I love the white and blue in your kitchen. It looks so warm and summery! The sunflowers and painting are stunning ~ another reminder of sweet summertime. the temperature here in Baltimore has been above 50, kinda weird for January! Oh, gee. I just love looking at your house. It's so cheery and cozy. Just my style. Perfection. I love your little lampshade with the red and yellow toile/blue white checks. What a cute combo! Your painting is beautiful. Oh, how I love receiving your blog! Every time, it is so uplifting. Your house is just lovely, cosy and inviting. I love your collection of roosters, too. 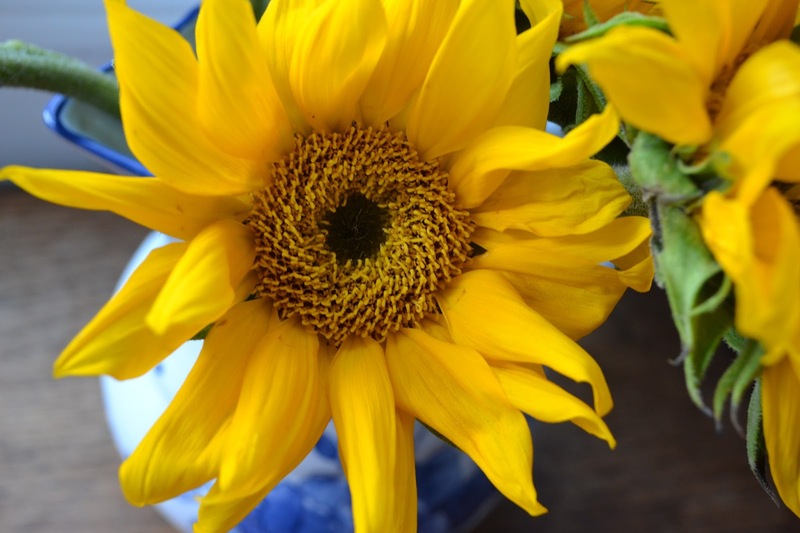 Your painting is beautiful...how nice to see the splash of yellow from the always happy sunflowers. 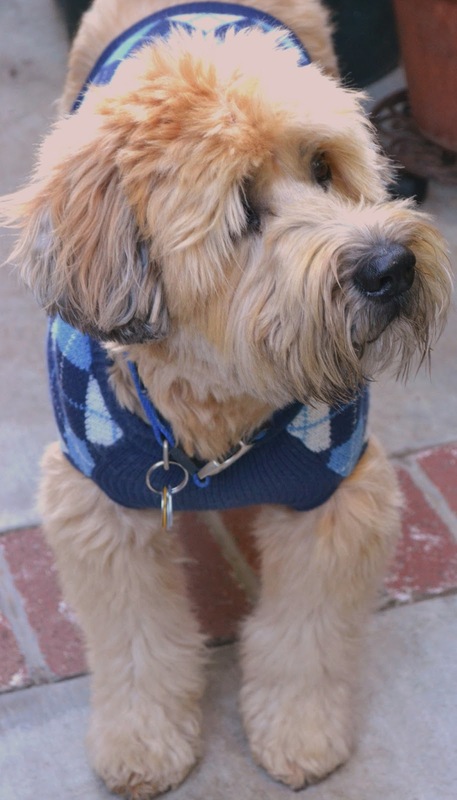 And Mr. Bentley looks dashing in his new argyle sweater...also blue and white. Beautiful Kitchen Erin....your painting is beautiful too. Have a creative week. 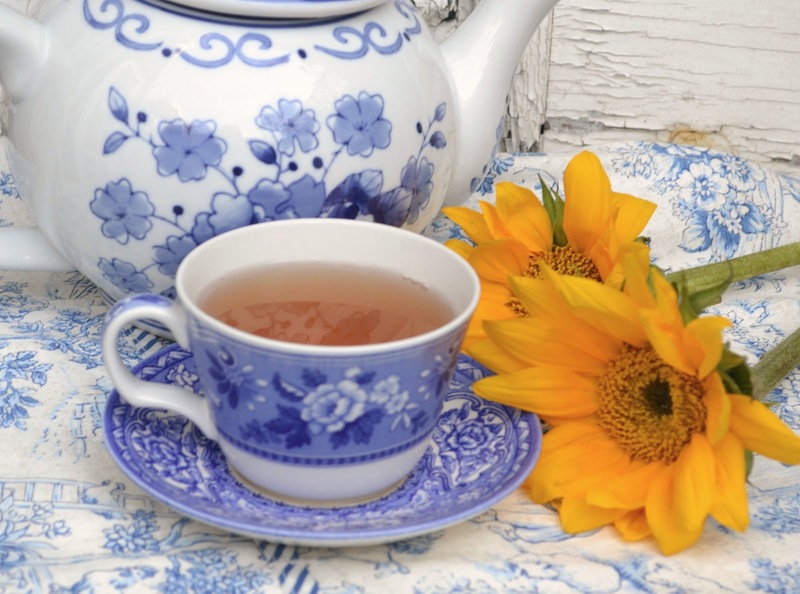 Love your cottage kitchen!!! Especially the garden view from the French doors.... Charming! Your home is so precious, I just love everything. I could just move right on in! Your home is so precious. I just love everything. I could move right on in! I also live in Southern Ca. Have a beautiful weekend, let it inspire the best out of you.